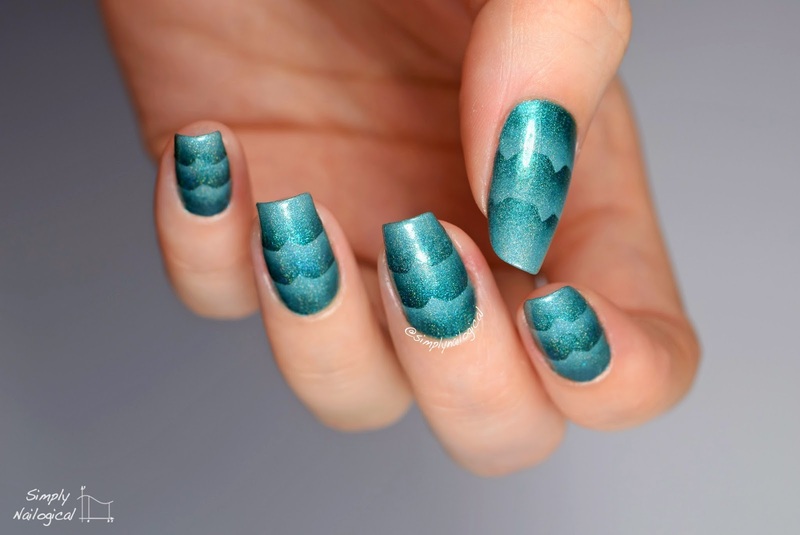 Another scaled gradient, you ask?! Yep. And I'm not apologizing. Someone on my Instagram actually commented that I do too many of them. You know what I thought?? I don't give a. I just love the clean, crisp yet deep look they give off. There's something about lines without actually having blatant lines in artwork that has always been appealing to me, like Lawrence Harris' work. I'm Canadian, so yeah. Deal with it. 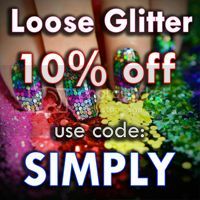 The lovely folks at I Love Nail Polish (ILNP) sent me some holo babies* to play with and I was oh so delighted. Christa aka beauty blogger Chrissy AI reached out to me and told me I didn't even have to trade my liver. I was relieved. Here's my first look so far with my new (and very first!) ILNP's. Turned out like a mermaid from the future if you ask me, featuring my fav colour, teal. 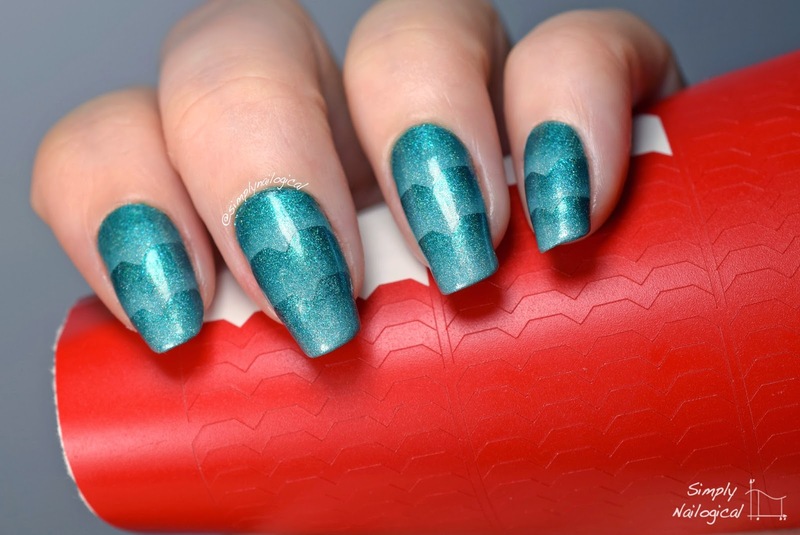 The nail vinyls I used for this look are called 'mini raz' vinyls and I got them from Up Your Nail. 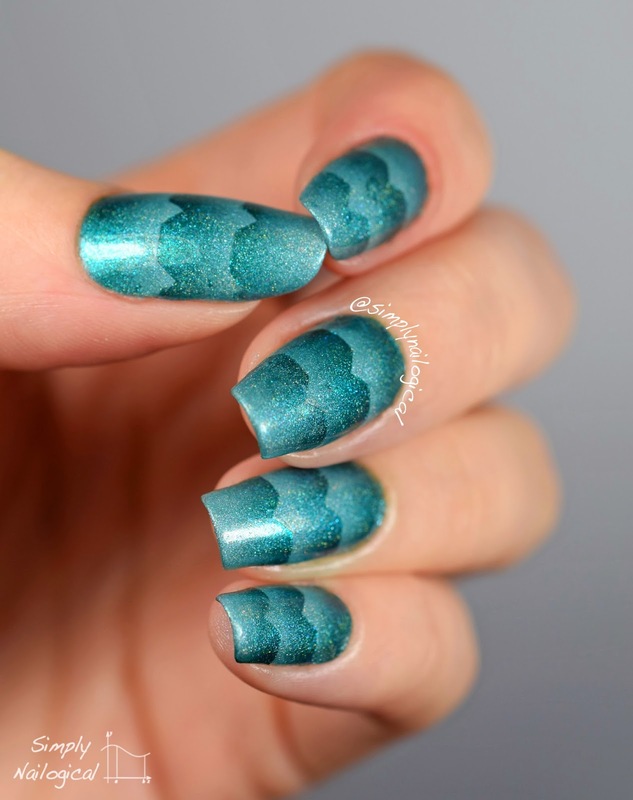 They are not curved edges, they are more or less half-hexagons and thus yield a more futuristic scale effect as opposed to the traditional rounded mermaid scale. All pics were taken under daylight simulator bulbs because I have seldom access to direct sunlight, boo. I used two 5200k 28W compact fluorescent bulbs (CFL) I picked up at my local photography store, no camera flash. The holo in these two polishes does indeed come out more in the actual sun, but unfourtunately I don't have that luxury. 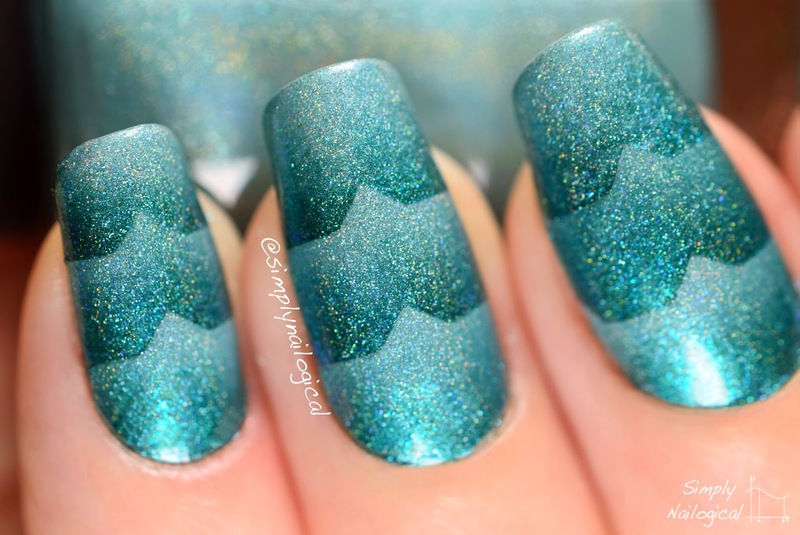 Get ready for tons of pics 'cause I love this mani. My fav colours. Ever. I just about died when I first opened the box and saw them just chillin' there, waiting for me to indulge. My fav quick dry top coat, HK Girl by Glisten & Glow. 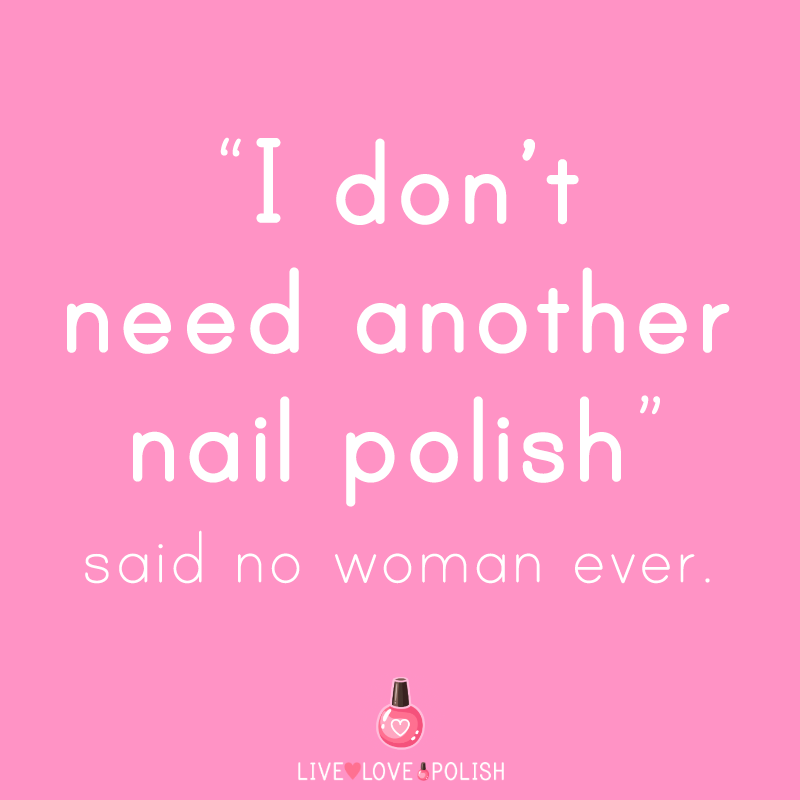 No polish shrinkage, dries super quick, and no peeling off of the polish base coats! It's truly a miracle, there would be no way to do this kind of calibre of scaled gradient without it. The 'mini raz' nail vinyls, which I got from Up Your Nail's online shop. 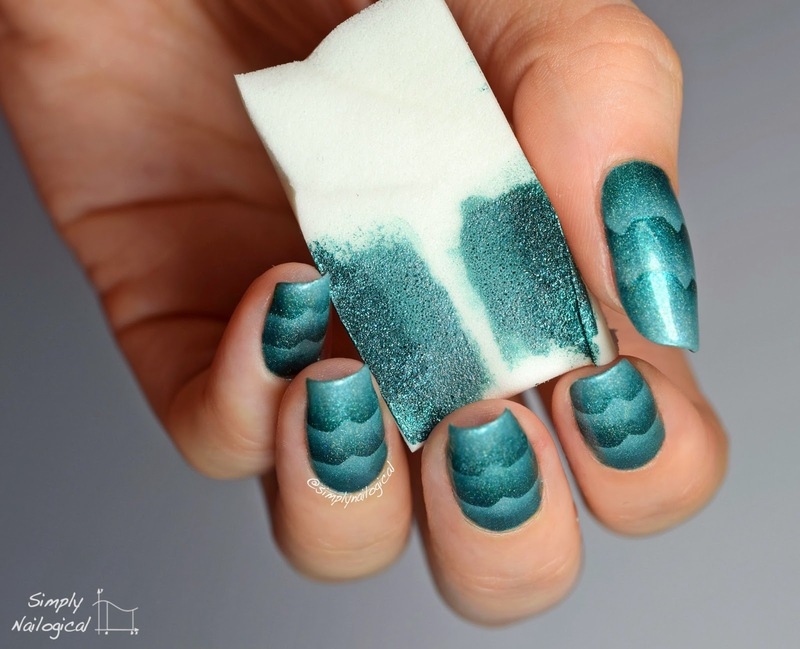 A dense make-up sponge, used to apply the polish to the nail and blend it into a gradient. 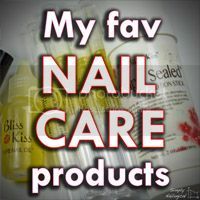 I use ones I picked up from the cosmetics section of my grocery store, but you can buy these almost everywhere. I try and fit a few gradients worth on one sponge before disposing of it. 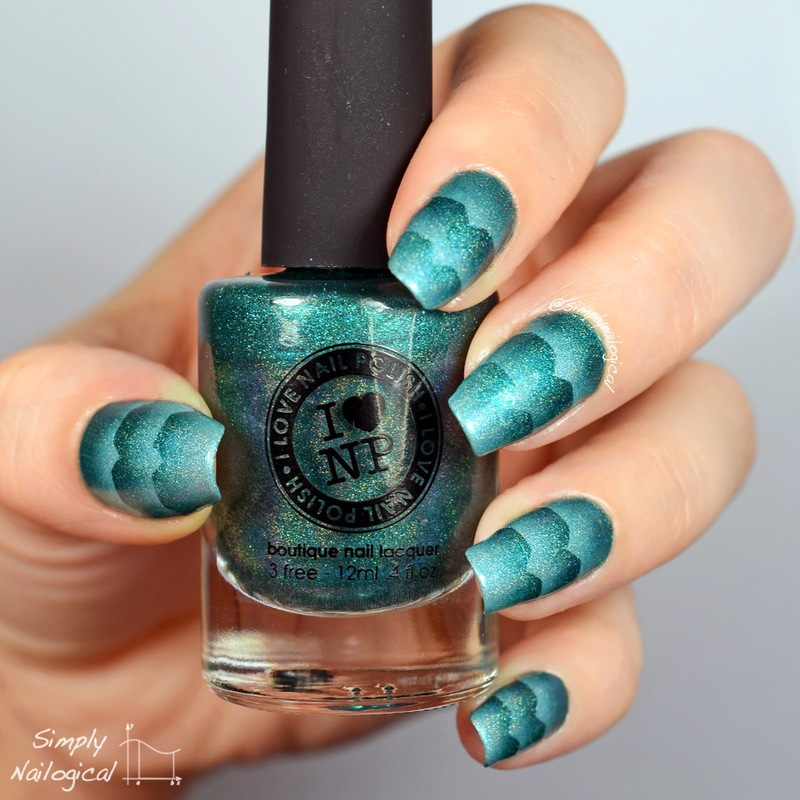 Read more about sponges, nail vinyls, and the scaled gradient technique in my Gradient Guide. Instead of detailing all the steps taken here, please see my Gradient Guide which explains the basics of gradients and of scaled gradients in particular at the end of the page. 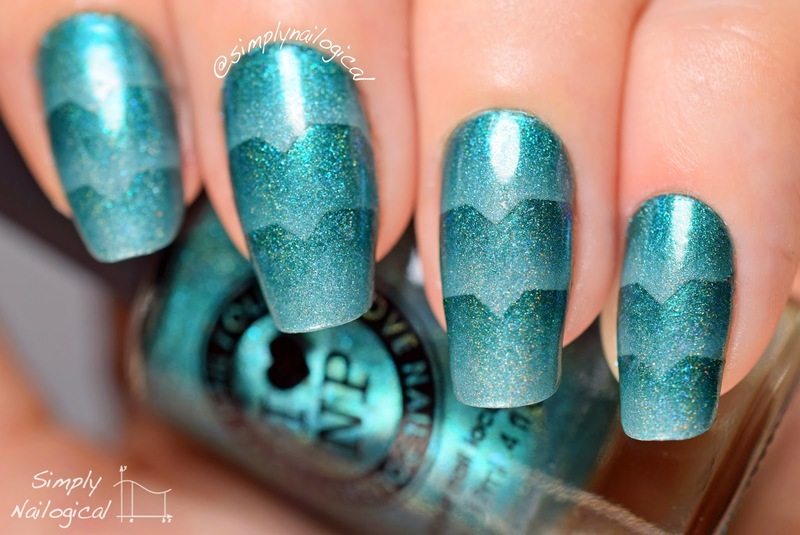 You can also see the first triple scaled gradient I ever did here, where I wrote step by step directions. 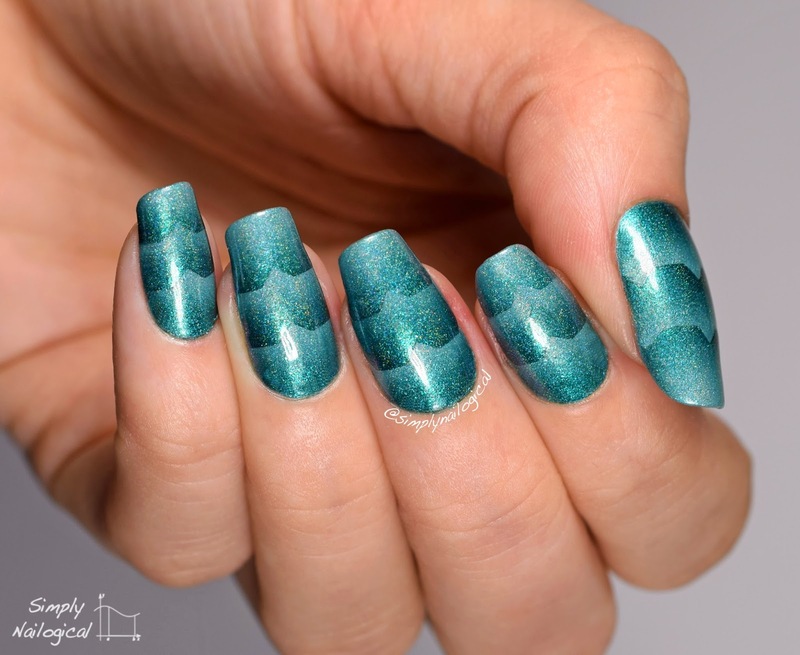 One difference worth nothing is that when working with more translucent polishes such as holos like these, you will need to build up more layers of each gradient, whereas with creme polishes that are more opaque you generally only need 2-3 coats. Here I believe I used 4 coats per gradient, multipled by 3 = 12 coats total. 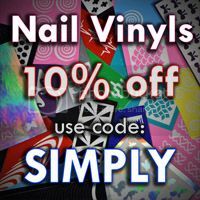 Sounds like a lot but it's not 12 coats over the whole nail, that's 12 dispersed/divided coats at varying sections on the nail. The important thing to remember is to ALWAYS do more very thin coats rather than less thick coats. You can build up thin coats and everything will go smoothly, but it you start to tack on thick gloops of polish it's almost guaranteed that you will ruin all your hard work by pulling up the polish, getting the sponge stuck in the polish on the nail, or having a not so blendy gradient. All a bunch of fugly things. *Products provided for review in exchange for my honest opinion. All comments are my own. Love love love ! 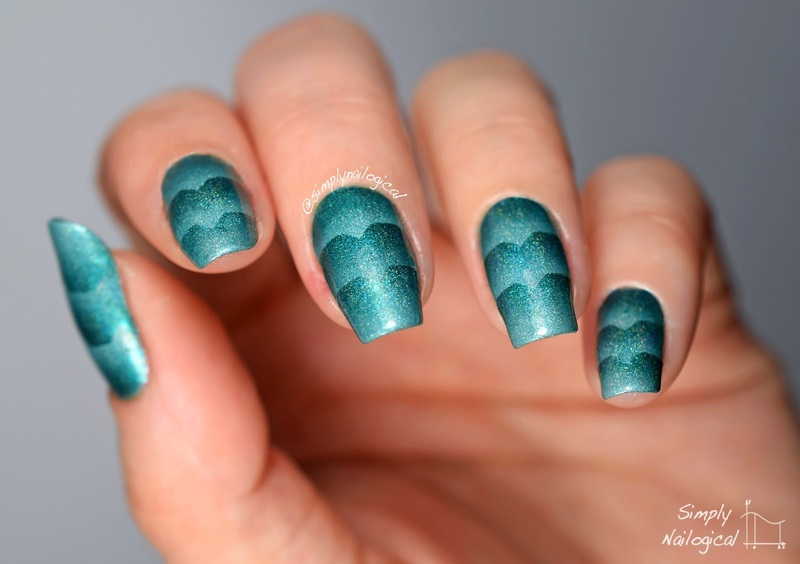 Simple but stunning manicure ! 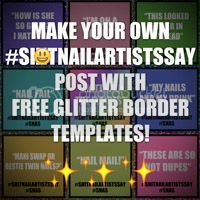 Mani swap with Dorra of Didoline!